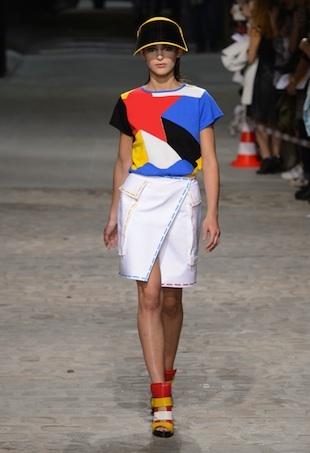 See all the looks from the Jean-Charles de Castelbajac Spring 2015 runway show. Beautiful, professional, a little smartly silly — JC/DC is describing (while dressing) the modern woman to a T.
Despite the fashion-forward looks, wearable silhouettes made it an approachable collection. Don't mess with the Castelbajac girl this season. If the cartoon-worthy choker that closed is any indication, Castelbajac's humor can't be tamed. A compelling peek at some of the behind-the-scenes action from fashion week in New York, Milan, Paris, and London. There was plenty to love from this season's Paris collections. 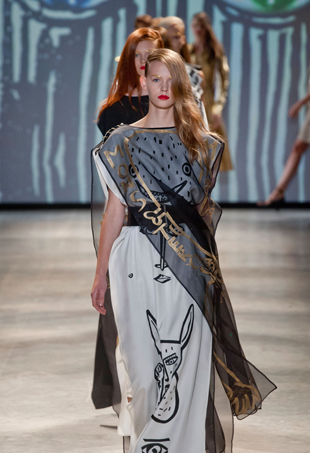 Jean Charles de Castelbajac's humor and boundless imagination was once again on display in his Fall 2011 collection.